Heading West from Montpelier towards the beautiful old monastery at Saint-Guilhem-le-Désert, you will come across the small market town of Gignac. The picturesque Château d’Aumières is just outside the town. 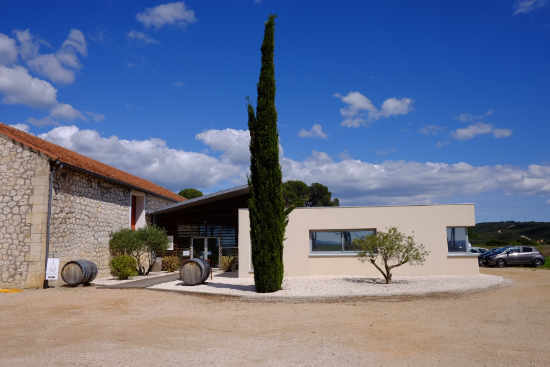 It consists of 40 hectares, abutting onto the vineyard of the world-famous Mas de Daumas Gassac, and into the mountainous Terrasses du Larzac where they have 15 hectares. They share some of the same terroir that has made the Cabernet Sauvignon of Mas de Daumas Gassac so highly sought after. Even Robert Mondavi from the Napa Valley tried (and failed) to buy land here. 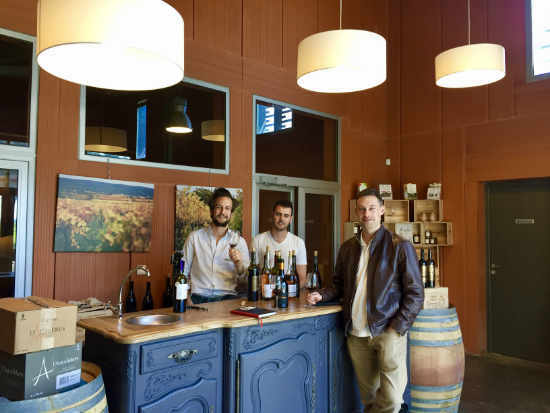 Last year, it was here that we met Vianney Castan, the fourth-generation winemaker from a family who have been making wines in the South of France since 1907. In 2013 recognising the huge potential of the vineyard and its terroir he purchased Château d’Aumières. Over the previous decade the vineyard had struggled to survive with a number of different owners. Vianney acquired an eclectic palate of grape varieties, ranging from the Bordelaise Cabernet Sauvignon and Merlot, to the Southern varieties of Syrah, Grenache and Carignan. He immediately invested heavily in new vinification equipment. At the same time he installed a dynamic young team to bring this vineyard into the 21st century. The wines we shipped last year sold very quickly, and this year we decided to revisit in May. This time we met Charles who is in charge of exports and he gave us an outstanding tasting of all their wines. We were especially impressed by the new vintages and also by the new l’Affranchi, an exciting Grenache/Syrah- based cuvée. The Merlot grapes are ideally suited to this perfect microclimate with its cool summer nights. They are destemmed and carefully vinified in temperature-controlled cuves, after which the wine is aged just for six months in old oak barriques. It is a bright purple in colour with a ripe berry, Merlot nose with hints of toasted brioche. This leads into a soft, ripe mouthful of plummy dark fruit, finishing with soft tannins and hints of tobacco. Drink now and over the next two years. Essence of Merlot – delicious! Cabernet Sauvignon ripens perfectly in the limestone and loam of the marnes soil. It is vinified in a similar way but with only 20% of the wine in oak for six months, to maintain the wonderful fruit character. The colour is deeper, and there is a gorgeous nose of cassis and lead pencils. Pure, concentrated cassis fruit dominates the palate, with a silky texture, leafy hints and a touch of cedar at the finish. The tannins are soft and ripe and there is good length. This is perfect for current drinking but will easily keep for two to three years. It tastes for all the world like a good quality claret! This exciting new cuvée is made from 40% Grenache, 40% Syrah and 20% Carignan. He uses whole bunch fermentation, a traditional method, which is regaining favour. This tends to lower the alcohol level, increase freshness and complexity to the wine. Finally some of the Carignan and Syrah are vinified by maceration carbonique – the Beaujolais method – which enhances fruit flavours. The results are outstanding! Medium in colour, there is a vibrant cherry-liqueur nose with hints of sloes and Kirsch. This opens out into a delightfully soft, approachable mouthful of cherry fruit, light dusty tannins and a touch of liquorice at the finish. Gorgeous! This vineyard inhabits a dramatic mountainous landscape of the Terrasses du Larzac, which has recently gained its own appellation in recognition of the wonderful terroir-based wines from the region. The blend is 45% Syrah, 40% Grenache and 15% Carignan. To add complexity while maintaining the purity of the fruit, 30% of the wine is aged for 12 months in oak barrels and then blended back in. The resulting wine is medium in colour with a gentle minty nose – almost After Eight chocolate – and hints of truffle. The palate is bursting with black fruits. It is rich and complex with gamey flavours, a hint of liquorice at the finish, very little tannin and great length. Yet, it remains surprisingly elegant. Be the first to review “Château Saint Jean d’Aumières” Click here to cancel reply.